Fortrade Review: is it a scam? Fortrade Review: Good, bad or scam? Fortrade was launched back in 2011, and as such, it can be considered one of the mainstays of the CFD trading industry. Some sources say the operation was launched in 2014, but that's actually the year when they picked up their license. Based in the UK, the company is regulated by the FCA (Financial Conduct Authority) and it has to comply with some of the strictest financial directives in the world, as you can read here. To receive an FCA license, a broker has to fulfill a number of eligibility requirements and it has to produce proof of financial stability. One of the requirements is to keep company and client funds separate, in segregated accounts. In addition to that, all FCA brokers have to have at least €730,000 on hand. There are similar requirements in other jurisdictions as well. CySEC regulated brokers have to hold at least €1million, while US-regulated brokers have to have at least $20 million. Even more importantly, FCA regulation places the customers of all licensed brokers under the Financial Services Compensation Scheme, which covers damages of up to £50,000 per person per broker, in the event of a bankruptcy or another type of calamity. Get a free €10,000 Fortrade practice account! Given the strict regulatory environment in which Fortrade operates, it isn't exactly surprising that try as we might, we just couldn't dig up any filth on them. There aren't any scam reports about them out there. In fact, even sites that specialize in such scam reviews, talk about Fortrade in favorable terms. Besides FCA regulation, Fortrade have a number of other aces up their sleeves too. They offer a decent bonus on trader deposits, they feature 3 in-house trading platforms, they offer MT4 access and they have no fewer than 300 tradable assets. Fortrade also offers a lot of good education in the Fortrade Academy with ebooks and videos on technical analysis and top trading strategies. From time to time there even are some interesting webinars. Lastly Fortrade also offers negative balance protection: you can lose all, but not more than the balance of your trading account. With a lot of other brokers you can run up debts if your account falls below zero due to losses of bad trades. As said above, Fortrade feature three trading platforms, all of them created in-house. Since 2017 Fortrade is also offering MT4 support. Desktop Fortrader is what could be considered the flagship platform of the operator. It is a downloadable software package, which includes all the perks and trading tools that Fortrade have been able to develop thus far. The Desktop Trader comes a with customizable trading environment and a full range of tools which cover just about every imaginable angle and need. The only disadvantage is the lack of technical indicators, while the charts are very clear and suitable for price action trading. Web Fortrader is the no-download version of the above described Desktop trader. It is fully featured, meaning that it delivers all the functionality of the downloadable software. 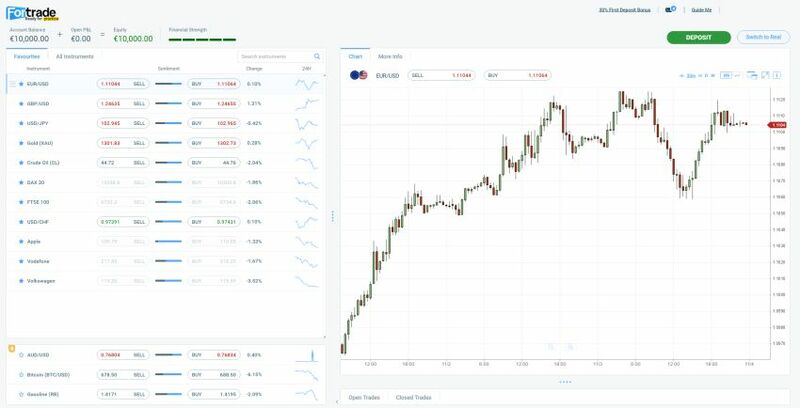 The Web Fortrader can be accessed from any computer with an internet connection. Mobile Fortrader is a similar solution which covers the iOS and Android-based mobile market. It too offers full functionality, lending traders the ability to perform market analysis on the go. MT4: the well known trading platform MetaTrader 4 (MT4) is a very good platform for more advanced traders. You get access to more technical analysis indicators, you can use expert advisors for automated trading, build your own trading algorithms or back-test a strategy. This section is a short one, because Fortrade only features two accounts. The first is the standard account on the Fortrader Platform. To access all the above described features, traders are required to make a minimum deposit of only $/€/£ 100. A Demo account is also made available to depositing customers, with a virtual currency balance of €10,000. The Fortrade MT4 account offers access to the very popular MetaTrader 4 trading platform. No commissions are charged by Fortrade. Their spreads start from 2 pips on popular currency pairs like the EUR/USD, also depending on whether you are using the Fortrader platform or MT4. Leverage levels are determined based on the traded asset-type. All-in-all, Fortrade's spreads aren't always the cheapest in the industry. The Fortrade support can be reached via email, and their response times are good. Phone support and live chat is available too, although only in English. The Fortrade website supports German, French, Spanish and Italian too. Fortrade's Online Academy offers beginner's trading courses, forex and CFD ebooks, trading videos, advanced trading courses and top day trading strategies. Those looking for a stable and well-regulated broker which offers negative balance protection, will like Fortrade. The attractive minimum on the deposit is a plus, as is the in-house platform and the functionality it delivers.